The Samsung ProXpress series is fairly popular in the market. It is also a fairly important B2B offering from the Original Equipment Manufacturer (OEM). We have already talked about one printer model in this series on our blog in the form of our Samsung ProXpress M4070FR review. 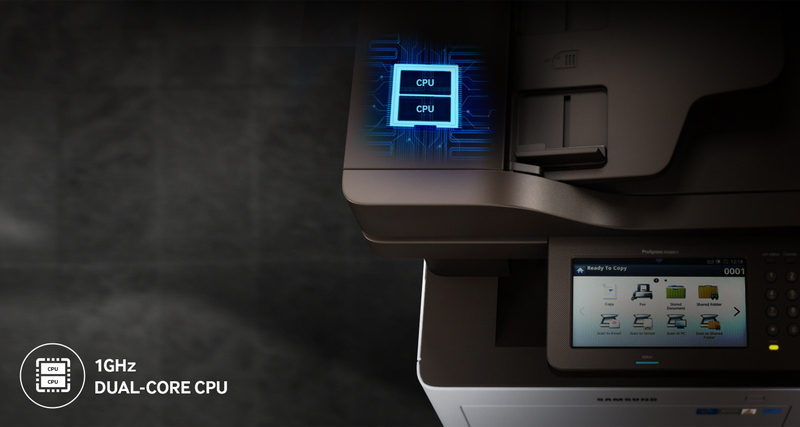 The M4070FR was an entry-level multifunction printer aimed at the micro and small office segment. Now, we’ve turned our attention to the Samsung ProXpress M4080FX. The Samsung ProXpress M4080FX is a monochrome laser multifunction printer that is ideal for those small to medium scale businesses that value scalability as much as speed and output quality. In fact, there is a lot that potential buyers will appreciate about the M4080FX if they only look deep into this machine. 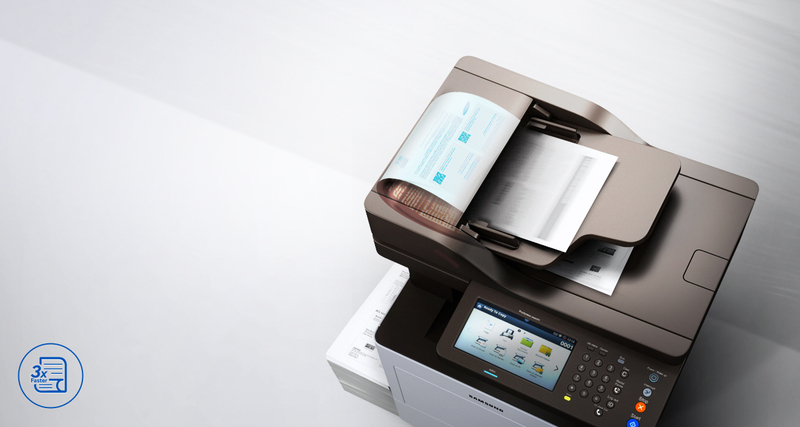 To help you delve the depths of this multifunction printer here is our Samsung ProXpress M4080FX review. 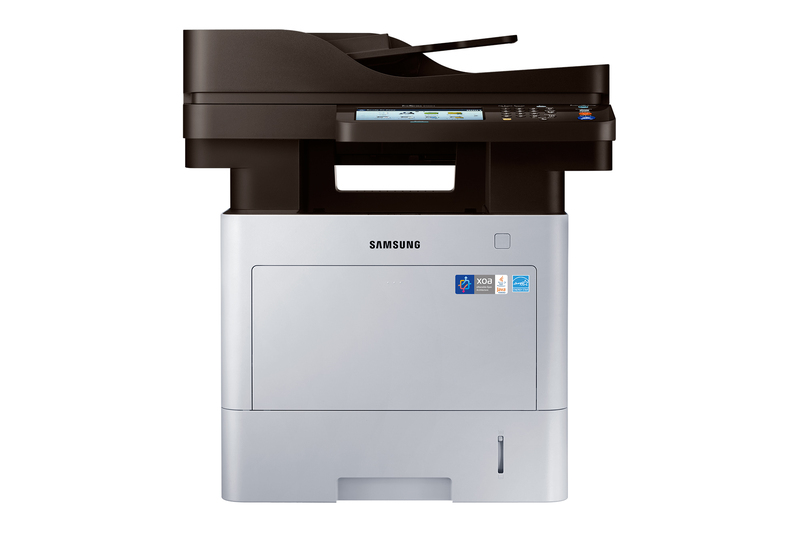 The Samsung ProXpress M4080FX is a fast monochrome multifunction laser printer, which makes it possible to use it for high volume printing. Formally, it is rated at a speed of 42 pages per minute (ppm). This is slightly higher than the M4070FR because that multifunction printer was rated at about 40 ppm. The high volume printing angle is fairly strong with the Samsung ProXpress M4080FX i.e. its other features also support that principle. Consider the fact that this machine has a maximum paper capacity of amazing 2,300 sheets, albeit if the optional add-ons are included. The standard variation of this printer can handle up to 650 sheets split between a 550-sheet cassette tray and a 100-sheet multipurpose tray or bypass tray. In addition to this, there is also a 50-sheet Automatic Document Feeder (ADF). Another feature that backs the high volume nature of the Samsung ProXpress M4080FX is its rating for monthly duty cycle. This multifunction printer is rated at 120,000 pages per month. 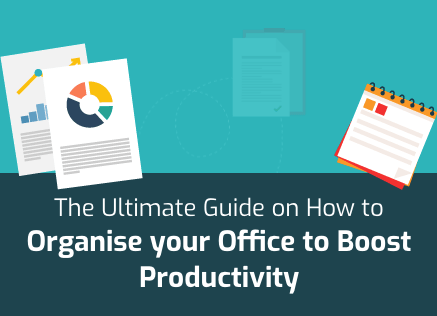 The monthly duty cycle of the M4080FX is higher by about 20,000 than the monthly duty cycle of M4070FR since the latter is rated at 100,000 pages per month. While the fact that the Samsung ProXpress M4080FX gives scalability benefits to its owner w.r.t. the volume of prints is important, something even more important is that it does so without taking the costs through the roof. The running cost of this multifunction printer is around 1.65 cents per page if genuine or OEM cartridges are used. 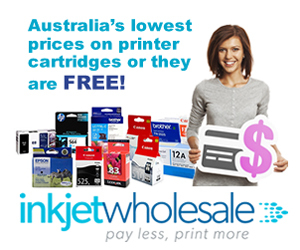 Alternatively, though, if generic cartridges are used, the running costs go down further to only 1.15 cents per page. The reason why these numbers are so positive for owners is that this device is compatible with Samsung’s high yield cartridges. Along with this, the M4080FX further supports economic printing by offering automatic duplexing facility to its users. Needless to say, using this feature will halve the paper costs for the user. The biggest issue you’ll face with this device if you were to buy the Samsung ProXpress M4080FX is that you’ll have to shell out a pretty sum for it. The initial cost of this device is higher than many of its competitors but that is balanced out by the fact that its running costs are lower than most of its competitors. Another flaw of the Samsung ProXpress M4080FX is its size. By no yardstick can this device be considered compact. In fact, its size and weight make this device very cumbersome and tedious to handle. So, if you’re going to get this device, you need to be very careful about where you have it installed because you won’t be able to move it around on a whim. Technically, this machine weighs a significant 25 Kg and measures about 530mm wide, 451.5mm deep, and 576mm high. In comparison, the M4070FR is much more compact and lighter. An equally glaring flaw is the absence of Wi-Fi Direct facility. 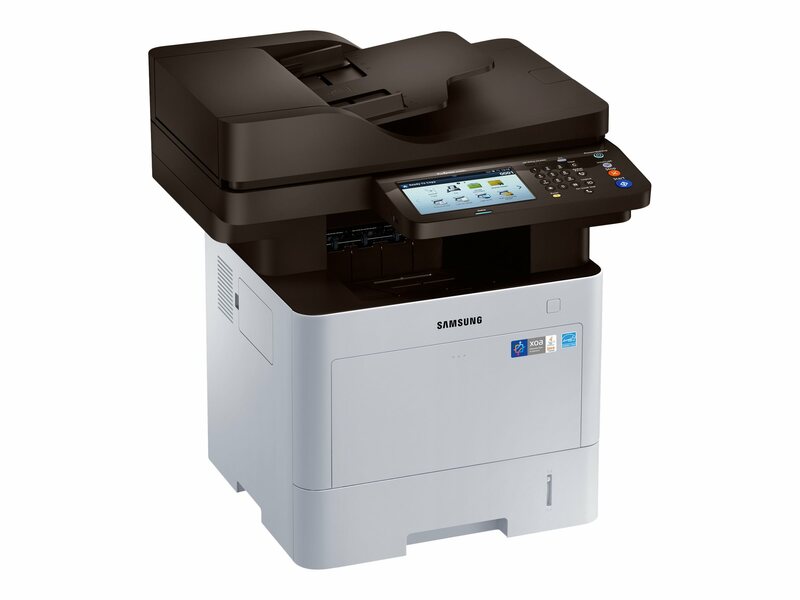 Most B2B multifunction devices, these days, have this facility which is why its absence in the Samsung ProXpress M4080FX is standing out so much. While there is Wi-Fi Direct functionality, Samsung does provide wireless connectivity as an option. In the standard version, this printer can be connected to the internet through the USB 2.0 or Ethernet port. Once online, this printer supports mobile printing through apps such as Samsung Mobile Print and Google Cloud Print. Additionally, the device also supports NFC connectivity – something that can come in very handy. All in all, we find it relatively safe to recommend the Samsung ProXpress M4080FX for businesses that expect to scale up in the future. If you’re worried about output quality, you don’t have to be because the maximum resolution to which this device can print is 1200 x 1200 dots per inch (dpi). The maximum scanning resolution, on the other hand, is 600 x 600 dpi. The speed of the device is boosted by its 1 GHz dual core processor. The M4080FX has good inbuilt memory too. The standard version has about 1GB but there is the option to double it. This option is not available with the lower model M4070FR. Controlling the printer physically is made possible through a control panel that boasts of a 177.8mm LCD touchscreen. In M4070FR, this touchscreen is smaller at only 109.22 LCD touchscreen. Another specification worth considering is that the Samsung ProXpress M4080FX will spit out the first print in six seconds.